Last time, I explained how to prep an unfinished woodgrain fiberglass door for staining. This time, we’ll stain and seal the fake wood to give you an entrance that looks like the Real Door it wants to be. This analogy breaks down rapidly, I admit. There are a lot of tutorials out there for this job, but I found that some issues were not covered and that not everything worked as advertised. The process described here integrates the adjustments I made. 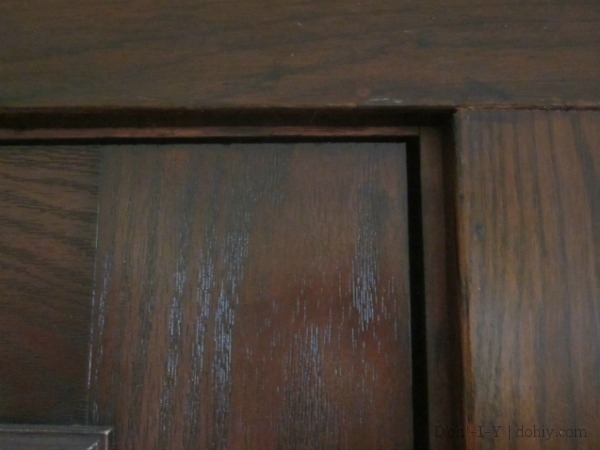 As I mentioned last time, this series describes how to stain a door that is already embossed to look like wood — to learn how to fake woodgrain on a flat door, check out this video. In Part 1, I listed project supplies. You will need gel stain for this project. Fiberglass is not porous, so it will not take traditional wood stains; they just puddle up on the surface or streak. “Staining” fiberglass is really a sort of faux finish because the gel stain all settles on top. The thick formulation simulates the depth of a real wood stain. I like Old Masters and General Finishes, but Minwax is fine, too, and easier to find. As long as it’s gel stain and it’s the color you want, go for it. Once you know what color you want the finish to be, head out to look at gel stains, keeping in mind you can layer different colors to reach something that isn’t already on the shelf. Also, the darker you want your door’s finish to be, the more coats you will need to build up. 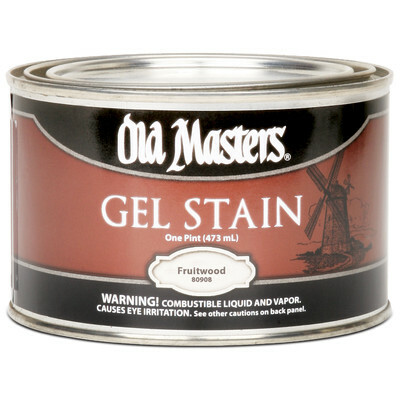 Keep in mind that gel staining involves removing much of the stain after application, so you may need quite a bit. I used up about half of an 8-oz. can of black stain, half of an 8-oz. golden oak, and about half of a quart of Old Masters mahogany shades. I was completely lavish with the stuff and I was going for a deep finish (with the same general layering concept as my other stain-matching exploits), so judge your needs accordingly. Since then, I’ve become more efficient, but don’t worry about using a lot of stain — it’s not that expensive (relatively speaking), and I like the result I achieved that way. After assembling your supplies and prepping the door, set it up where you want to work. I preferred working on it on sawhorses, but you may like to be more vertical. Gel stain doesn’t really run, so vertical is fine from that perspective. I worked vertically after I had to move indoors from the garage. Door is well over halfway stained here, but you can see the problems I had around the window. Whether horizontal or vertical, it’s important to respect the full drying time, and then some. You want the surface Sahara-dry before you flip it and lean the new stain against a saw horse or a wall. I did one whole side to completion before doing the other side and then the edges. Raised panels and adjacent recesses. Interior flat surfaces that have vertical graining. Flat surfaces that have horizontal graining. Flat surfaces on either side of the door (these will be vertically grained). Finishing the panels in a certain order is a good way to make sure that you aren’t leaving weird smudges and lines against the grain. If you go in this order every time, you will also know where you’ve been as the layers build up. Early in the project, I learned the importance of sticking to the same order. The arrows show places that didn’t get a full finish on the first red layer. Don’t worry if you overlap from one of these categories onto another a little bit — it’s all getting stained eventually! Having said that, when you are doing one side of a door, plan to continue until you’ve hit all the surfaces on that sides to avoid smudging at the overlaps. 3. And Now, At Last, The Actual Staining! Welcome to the heart of the project! It’s time to crack open the stain. There are two ways to apply it: brushing or rubbing. I bought some outrageously priced brushes, but later found that rubbing the stain on with a painter’s pad worked better for me. My technique ultimately involved rubbing on the stain with one pad, then buffing it with another to get a uniform finish. Moving across each side of the door from inside out, I built up thin coats until I had the depth of color I wanted. I ended up with six coats on each side (I layered colors to match our existing woodwork). Layering colors: golden oak + red = NEON! Every tutorial I’ve seen says to go with the grain. I found an exception. The grain effect on fiberglass is achieved through texturing, with the “grain” being lower than the surface. 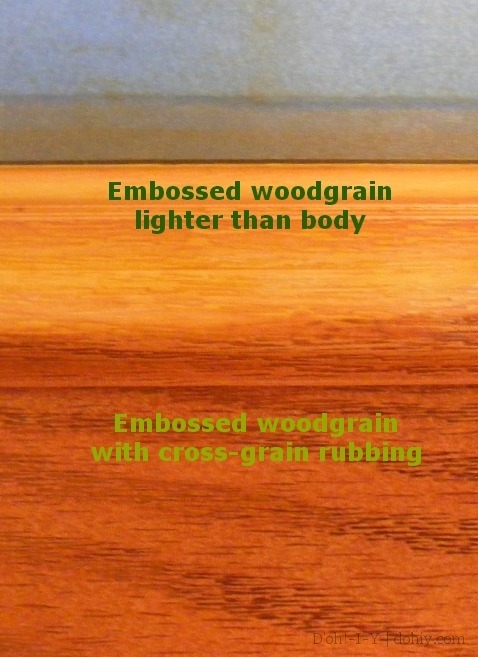 Look at any piece of actual stained wood and you’ll see that the grain is the darkest part of the surface, but fiberglass graining means the lowest points are recessed and easy to skip over. If you find grain that is not getting stained, rub (or brush) harder! 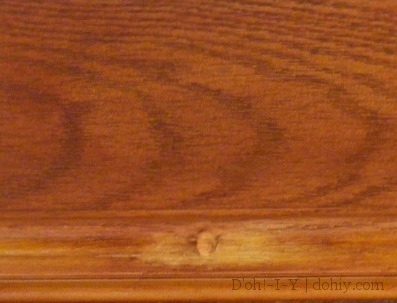 But also try moving a dark stain cross-grain just enough to deposit stain in the lowest grooves. IMMEDIATELY rub that area with the grain to avoid smudges. I used a Spanish Oak (almost black) stain for grain emphasis and for overall darkening. 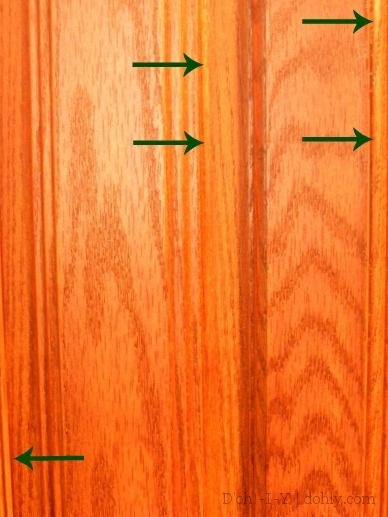 If you are trying to match existing woodwork, try to bring some of the trim you are trying to match into your workspace. I laid down a golden oak base, then layered an Old Masters mahogany tone. When I compared to our trim, I discovered that my initial mahogany layer was tending a little too aubergine (US: eggplant), so I buffed that layer down and used a redder version for subsequent coats. Without the trim to place right up against the door, they would have looked the same to me and given me a mismatch. The trim will also let you know when you’ve made the finish dark enough. Here’s the door against the pre-existing interior trim after hanging. This all sounds fairly straightforward (if time-consuming), but the tricky thing is avoiding tell-tale smudges. Wood absorbs stain, but fiberglass doesn’t care — the gel stain pigment just sits on top, and if you rubbed some of it unevenly, it will just set like that. The last thing you should do after each coat is to carefully examine each joint and panel to see if there are any smudges or lines left from your application or rubdown. Then leave the room, have a quick drink, and come back and look again while you still have some open time. More than once, I missed a smudge on first inspection, but taking a breath and coming back gives you fresh eyes. Smudges galore at the window plugs — this spot has been rubbed down a couple of layers with an eraser sponge prior to touch-up. If you find you have some smudges or lines after everything has dried, freak not. I found recommendations online to use mineral spirits (British: white spirit) to rub down those areas so you can start over, but that turned out to be hard to do in real life. That stain did NOT want to budge! 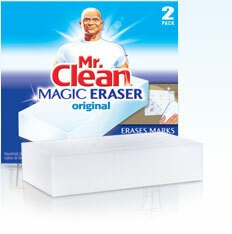 I found that a nearly bone-dry eraser sponge very lightly applied is much easier and as effective. These are terrific (and so are the generic versions). When you are fixing smudges or line, you don’t need to (and don’t want to) get down all the way to the original surface; you just need to get rid of enough of the smudge to build up a uniform finish over it. Use your judgment given the number of coats remaining and the stain color (the less you take off, the easier it is to match back up). Try to avoid this issue in the first place because feathering in can lead to more unevenness or smudging. Keeping your layers really thin will help you avoid this issue. After you’re certain — CERTAIN — that you are at the color and tone you want, and that you’ve fixed any booboos, and that the thing is super-dry, you can seal it. Use a high-quality spar urethane and follow the specific brand’s instructions. I used one that allowed the finish to be wiped on because I’ve never yet brushed on urethane without leaving bristles in the finish. I’m anti-brush! THERE, I SAID IT. If the urethane requires a sand-down between coats, take it very gently indeed. You don’t want to cut into your finish because it will come up in a big hurry. I used three coats in a satin finish. The door has been up for quite some time now, and it looks good! This morning on the porch. 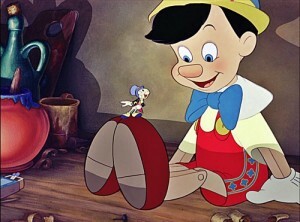 Those are not prop wellies! I really wear them! Visitors ask if it’s the original door, and I was tickled that a builder friend asked if I wanted to finish doors for him. I said sure if he wants to wait several weeks for each door while I cobble together the time. Full frontal with wellies! HELLLLOOOO, GOOGLE IMAGE SEARCH. So that’s that, then. Warm house, wood-like door. Hurrah! Anyone else sporting a fiberglass door? 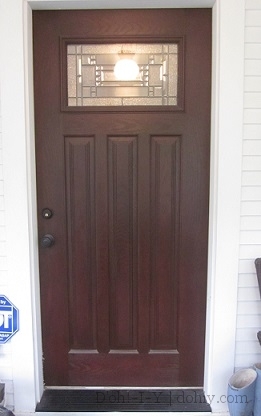 This entry was posted in American vs English, Decor, Windows & Doors and tagged gel stain on fiberglass, prepping a fiberglass door for stain, staining a fiberglass door to look like wood, wood-look fiberglass door. Bookmark the permalink. Hi, Sheryl — Are you saying you repainted and the door sticks, or that you stripped and repainted and they didn’t turn out right? Hope we can help! 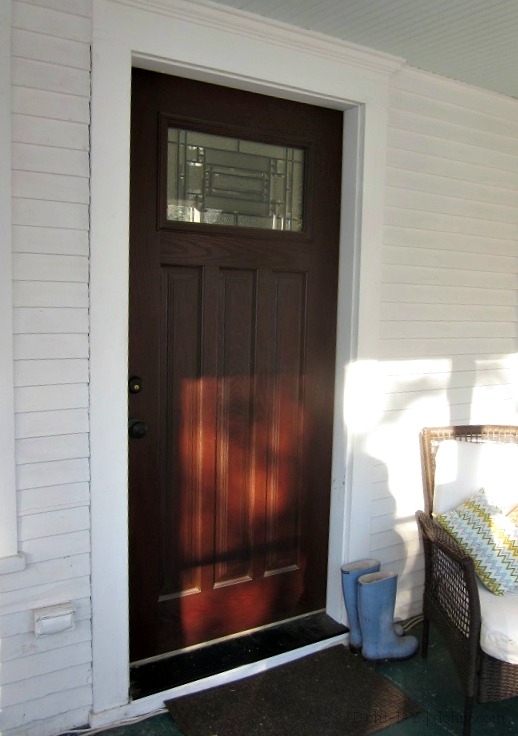 We have natural oak/golden oak woodwork and have been trying to finish our woodgrain fiberglass door to match. 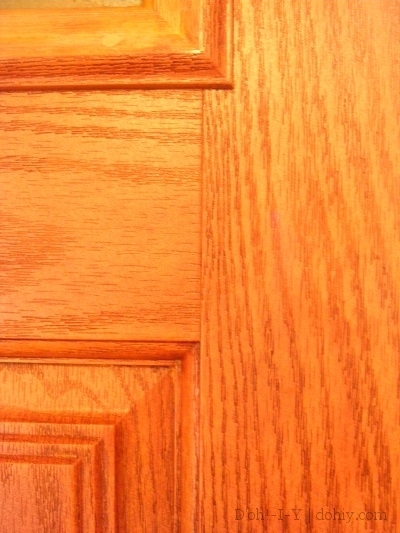 We have been using a honey maple minwax gel stain hoping to give the door the lightly golden tint. After 3 coats it hardly has any color. I am wondering if I should try golden oak now or ??? Hey, Kathy – sorry you are having trouble. The gel stain builds up on the surface and does not sink in to fiberglass because the fiberglass isn’t porous, so you could layer more gel stain on top if the color you have on is lighter than where you want to be. (Whatever you do, do NOT sand the door because that will ruin the fiberglass — plus, you don’t need to.) I’ve used Minwax’s golden oak as a base coat a bunch of times, and it always comes up very true to that color. In fact, I was helping a friend replace a cabinet door in a golden oak kitchen and used the Minwax and it was a perfect match. You might want to try leaving it on slightly longer before buffing it out, but check the directions on the Minwax. I really hope this helps — PLEASE stop back and let us know how it went. Good luck! What if the factory beige/almond base coat has been stripped and the underlying fiberglass on the door is green in color and the same with the side light, except the fiberglass is eggshell in color? What do you use to recreate the base coat and is the remaining staining process the same? Will…I did not even know that could be done (stripping it all the way down)! Is the woodgrain texture still there? Assuming the surface is still in good shape, I would guess (emphasis on the GUESS) you can gel stain it any color you want if you prime both pieces the same color first (probably beige/almond). Gel stain is really just a faux painting technique when you get down to it, so it shouldn’t matter if the undercoat is primer as long as it’s completely dry and cured before you start the gel stain. Please let me know what you do! Hello. How long does it usually take for a fiberglass door to dry? Mine is very sticky and has been drying for 12 hours now. It depends on a lot of factors — temperature, humidity, thickness of the finish, etc. I’ve had finishes still feel slightly tacky at 30 hours. It’s a long process! If you can warm up wherever you are working on it, that will help, and keep the layers of stain really thin so the in-between times are shorter. Stop back and let us know how it turns out! Hi Stacey, I have a Pelli craftsman door like yours finished dark outside and oak inside. I want to gel stain the inside dark mahogany….. what prep would you recommend on the factory finish before re staining ?